In the past, every second year in the autumn, private persons opened their houses for the "Biennale Art Nouveau Art Deco". Since 2017, it became the BANAD - Brussels Art Nouveau and Ar Deco Festival held in spring, from 11 to 26 March 2017. On the weekend of 18/19 March, the Hôtel Frison, built by Victor Horta in 1894 for his lawyer friend Georges Frison, will open its doors for the BANAD visitors. At this occasion, Margaretha Mazura will show her Art Nouveau fans under the title: Femmes 1900 - femmes fleurs et femmes fatales. For those that saw the past Biennale fan exhibitions, this is a new venue with new fans! 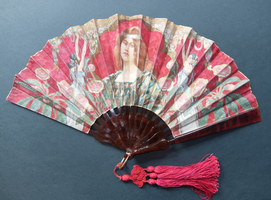 The exhibition shows Art Nouveau beauties but also fashion excesses like the reconstructed seagull on a fixed fan (HS collection). Download the catalogue (trilingual) - Dowloadez le catalogue (trilingue) - Katalog dreisprachig zum Runterladen.